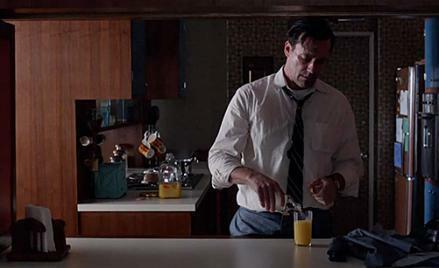 Mad Men: Don needs to go to Alcoholics Anonymous. Don Draper really needs to go to a meeting. I keep coming back to two scenes in this episode. First, when Kenny is shot, and second, when Don has an eye-opener. When I watch other series in the “serious television” category—Game of Thrones, say, or Boardwalk Empire—I’ve started to notice how often these shows fall back on a sense of menace, how often a vulnerable character is at risk, with music cues to match. TV certainly is much better than in decades past, but as a viewer there’s so much squinting and squirming, and “darkness” takes the place of “character development” as an indicator of quality. 24 was almost all menace and years later barely has a place in my memory, aside from “it was about torture and Chloe was cool.” I wonder if when people look back at the recorded entertainment that obsessed us in these years they’ll wonder why we wanted to be so worried all the time. And this used to be Mad Men, too. But this season hasn’t had as many of those moments where you watch through your fingers and bite your palm, hoping to God the awfulness stops. The gun isn’t just shown in the first act; it’s in the first few seconds of the first act and it goes off right away. And we don’t even know that Ken’s wife is pregnant until after we learn he’s alive. We find out because he tells us. It used to be with this show that anything could happen. A mysterious European nobleman could take an interest in Don, for example, and then he could drift back to New York. Weird stuff just kept happening. But the range of possibility keeps shrinking. I wonder if the surfeit of conspiracy theories about the characters is a reflection of this: As the show gets smaller and smaller, its viewers start to imagine more and more dramatic arcs, almost to compensate and bring Mad Men back into the realm of the familiar—that is, the dark menace of quality TV. So Bob Benson is not a spy. Nor is it likely that Don Draper will have a heart attack and fall out of a skyscraper and land in front of a little boy (and that little boy … was … Matthew Weiner!). Which is why I keep thinking about the scene where he loads up his orange juice with vodka, after Megan asks him to lay off. It’s not that he’s doing something transgressive by having an eye-opener. Don Draper has never cared what time it is. It’s that he acts ashamed, and worse, is hiding. Which simplified Don for me. The man doesn’t need to find love or accept himself or commit to Megan. Don needs to go to a meeting. He needs to dry out. So much of this show is about lying, to others or to yourself, but hiding your drinking from your wife is a different order of lying—the small, urgent, childlike need to feed the addiction. Don can’t even hold to his own code of respect and secrecy any more, which is why he pulled the rug out from under Ted and manipulated the firm back into Sunkist. And why? Because Ted had Peggy’s affections? Because the thought of not being in power is too excruciating for him to handle? Don is acting like someone who is afraid of being cut off: From power and from booze. It’s hard to imagine this man getting help. Betty went to therapy, as did Sally and as does Roger. But when I imagine Don on the therapist’s couch, my mind freezes. He just clears his throat for an hour and stares his beady stare. It’s even harder to imagine him at a meeting, working through the steps—making a personal inventory, and going out to the people he has hurt and making amends. Or drying out somewhere upstate. So far in this show that’s been the recourse for weaker men, like Freddy Rumsen, who hit bottom when he pissed himself in front of his coworkers, basically the bottomest bottom of all. Of course one of the ways that people hit bottom is they lose their job. That’s what happened to Freddy, but how could it happen to Don? Who would do the firing? This character is going to hold on to his emotions and his bottle with an iron grip. Thinking through what you both wrote, I suddenly realized: I’m not looking forward to the next episode. I’m not not looking forward to it, either. It’s just that I don’t need the story to finish. It’s not like Daenerys with her dragons or Jack Bauer trying to stop a nuclear bomb. There’s nothing ticking here for me, except for a very normal clock. So far—so far—this season the show has done such a good job of localizing the action around a few characters, stepping back from the pulpier aspects of the first few seasons (stolen identity, secret pregnancy) to give at least equal time to smaller but very real things like surly teens, complex divorces, and the eternal battle between Sunkist and Ocean Spray. Every season brings us less, not more. So what’s ahead for characters like these? Marriage or divorce, remarriage, early death, polyps, college bills, Florida. Once I might have dreaded the death of a character in the season’s final episode. Now I mostly dread that the show’s writers will feel obligated to kill someone off. The eighth level of Dante’s Inferno is fraud, and we’ve definitely seen a lot of that. The ninth level is treachery. Nixon is coming.